HE Bohemian Wax-wing is interesting for its gipsy-like wanderings, one winter visiting one country, next season another, often in enormous flocks, and usually with intervals of many years, so that in former times their appearance was regarded as sure forebodings of war and pestilence, their arrival being dreaded as much as that of a comet. Another interesting feature of its history is the fact that for a long time this familiar bird eluded the search of the zoologist. Its breeding habits, and even the place where it breeds, were unknown thirty years ago, until finally discovered by Mr. Wolley in Lapland, after a diligent search during four summers. It is also called the European or Common Silk-tail, and is an inhabitant both of northern Europe and of North America, though in America the Cedar Bird is more often met with. In the northern portions of Europe, birch and pine forests constitute its favorite retreats, and these it seldom quits, except when driven by unusual severity of weather, or by heavy falls of snow, to seek refuge in more southern provinces. It is said that even in Russia, Poland, and southern Scandinavia it is constantly to be seen throughout the entire winter; that indeed, so rarely does it wander to more southern latitudes, that in Germany it is popularly supposed to make its appearance once in seven years. On the occasion of these rare migrations, the Silk-tails keep together in large flocks, and remain in any place that affords them suitable food until the supply is exhausted. These birds are heavy and indolent, exerting themselves rarely except to satisfy hunger. They live in perfect harmony, and during their migrations indicate no fear of man, seeking their food in the streets of the villages and towns. They frequently settle in the trees, remaining almost motionless for hours together. Their flight is light and graceful, but on the ground they move with difficulty. 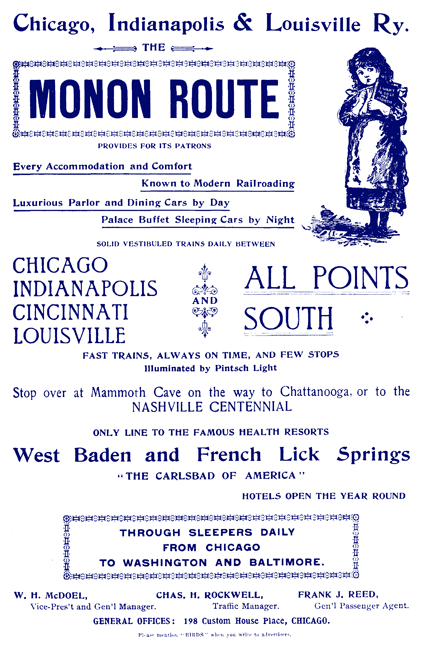 Their call note is a hissing, twittering sound. In summer, insects are their chief food, while in winter they live principally on berries. The Wax-wing will devour in the course of twenty-four hours an amount of food equal to the weight of its own body. In Lapland is the favorite nesting ground of the Bohemian Wax-wing. The nests are deeply hidden among the boughs of pine trees, at no great height from the ground; their walls are formed of dry twigs and scraps from the surrounding branches, and the cavities are wide, deep, and lined with blades of grass and feathers. There are five eggs, laid about the middle of June; the shell is bluish or purplish white, sprinkled with brown, black, or violet spots and streaks, some of which take the form of a wreath at the broad end. The exquisite daintiness and softness of the Wax-wing’s coat can be compared only to floss silk. 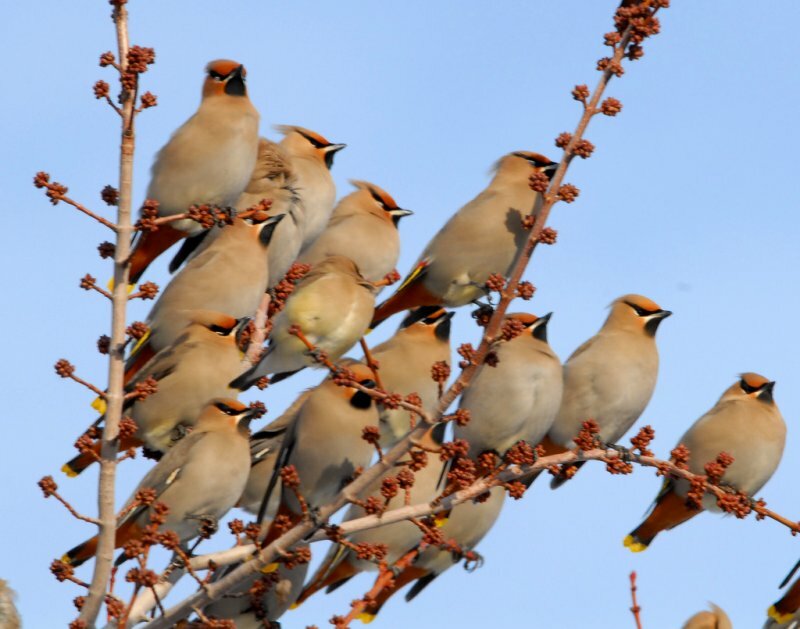 Bohemian Waxwings are in the Waxwings – Bombycillidae family. There are only three members; the Bohemian, Japanese and the Cedar Waxwings. Wikipedia says, The Bohemian Waxwing (Bombycilla garrulus) is a member of the waxwing family of passerines. A sleek bird, 18–21 cm long with a pointed crest, it travels in large, nomadic groups with a strong, direct flight. It breeds in coniferous forests throughout the most northern parts of Europe, Asia and western North America. As the Cedar Waxwing inhabits only North America and the Japanese Waxwing only Asia, the Bohemian Waxwing is the only member of this family whose range circumnavigates all the continents just below the sub-Arctic latitudes. Are larger, fatter and greyer than the Cedar Waxwing and has bright yellow, black or rusty orange color on its tail feather tips and a yellow, white, red or black stripe along the wing feathers. Under tail coverts are a deep rust color. Both beak and feet are dark and the brown eyes are set in a narrow black mask underlined with white. 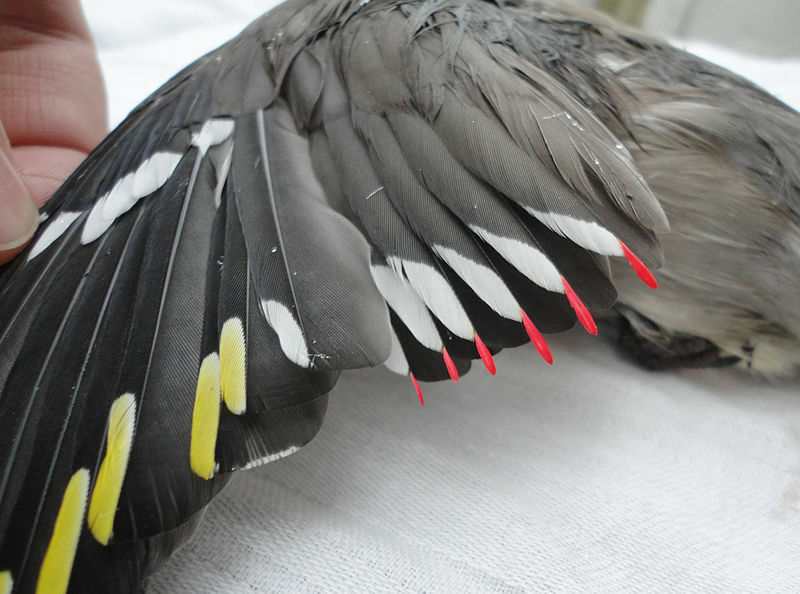 The call is a pleasant ringing sound, similar to that of the Cedar Waxwing but lower-pitched. The preferred nest location is usually high in a pine tree but feeding opportunities determine the location chosen. Each bird or pair may have more than one nest in the same general area. The nests have an outer diameter of 15 cm to 18 cm and are lined with fine grass, moss, and down. On average, 4 to 6 eggs are laid, the egg shells having a pale bluish color with a heavy sprinkling of blackish spots and some dark, irregular lines. Incubation is around 14 days and the young leave the nest about 13 to 15 days after hatching. 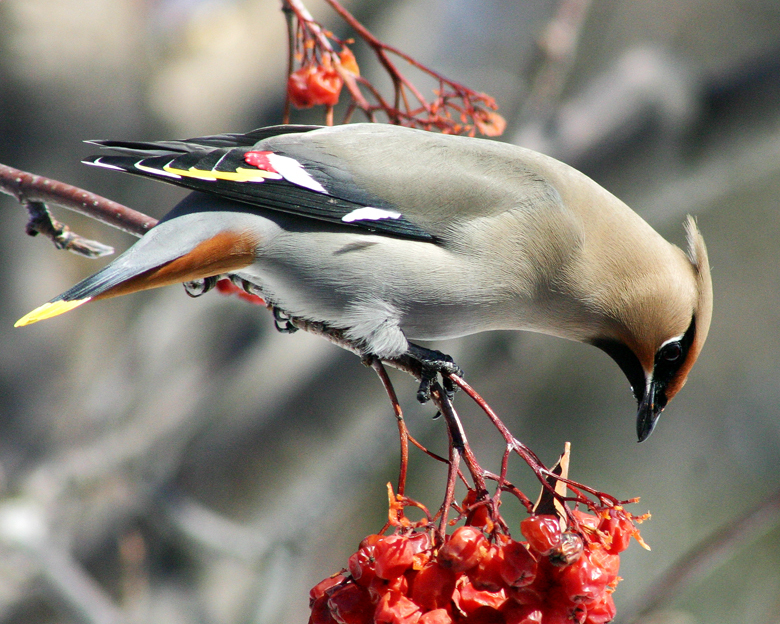 Like other waxwings, its diet consists primarily of berries supplemented by insects, especially during the breeding season. 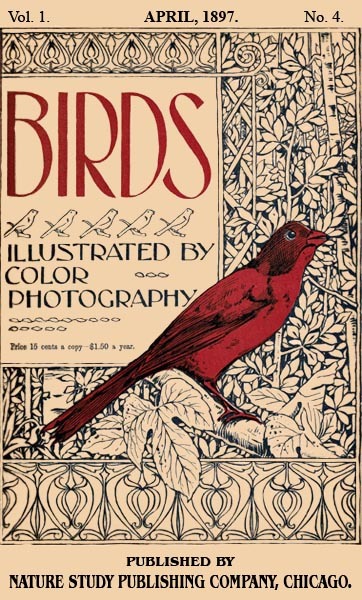 Its English name refers to the bright red bead-like tips of the secondary feathers on its wings, which look like drops of sealing wax, while ‘Bohemian’ refers to the Romani (gypsies), with a comparison to this bird’s wandering, or to its (presumed) origin from Bohemia (at the time, a relatively unknown “distant, eastern” place to most English speakers). The generic name Bombycilla, from Latin Bombyx (silk / silk moth) + Scientific Latin cilla (tail), is a direct translation of the Swedish name ‘Sidensvans’, silk-tail, and refers to the silky-soft plumage of the bird; the species name garrulus means ‘talkative’ and refers to a resemblance to the European Jay, Glandularius garrulus. 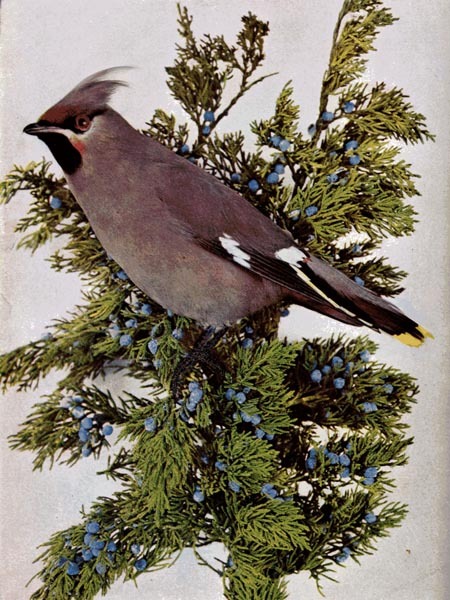 This entry was posted in Birds, Kid's Section and tagged Birds Illustrated by Color Photography, Birdwatching, Bombycillidae, Christian, From The Past, Home School, Kids, Nature, Vol 1 #4 April 1897, Waxwing, Youth. Bookmark the permalink. Sorry for leaning so much on Wikipedia, but I have been having leg spasms the last few days and can’t sit too long at computer. Next article will be better, I pray.